It seems as though the magic of Christmas starts to dissipate once we find out that there is no Santa Clause. That's when the magic starts to go away. The excitement of Christmas takes all the way up until college before it leaves. There's no more sleepy eyes and stumbling down the stairs. The mystery of what's under the tree (if there's even a tree this year) is gone. The new gadget you asked for? You got it. Or the boxer briefs you desperately needed? You're already wearing 'em. The Publix gift card? Completely unexpected - But you needed it. It's Florida. It's 80 degrees. And it's Christmas. I want to move up north. 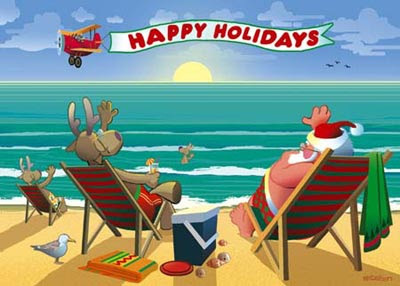 I want a miserably cold, hustle-and-bustle, stressed out and white Christmas. I want to dress like Santa for the kids down at the orphanage. I want to put reindeer antlers on a German shepherd named Charlie. I want to gift wrap a tiny little box that's barely big enough to hold the key that's in it. And then my wife's eyes will light up with joy. She'll look at me. And then I'll say "They were having a sale on keys down at Marshall's. Just kidding! Check the garage you beautiful piece of God's creation!" I'm a walking cliche'. What can I say? Christmas was good this past year. It was a Thursday. My dad cooked. I ate. We (AJ, Jessica, and I) ripped off our arms and gave them to AMC in return for the privilege of seeing The Curious Case of Benjamin Button. Great movie. Two Thumbs up. A little long, but it was enjoyable and had a Big Fish type feel to it. Seriously, though. Where do they get off charging a student $10.00 for a movie ticket?! It was 5:00pm on a Thursday. Sheesh. So onto the best part of Christmas Day 2008. For some reason Japanese Steakhouses stay open 365. It must be that never ending work ethic that the Asian culture continues to live up to. Either way, Jessica and I stopped in to Ichiro to grab some drinks and what we found was *drum roll, trumpets sound* The lover's bowl! 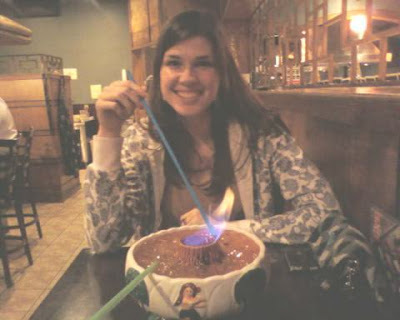 In a nutshell, it's a giant ceramic bowl filled to the brim with a very alcoholic cocktail, a flame that burns in the middle, and it comes complete with two giant straws to drink it down with.